Besides environmental and socioeconomic factors that contribute to lack of access and underutilization of care, trust and confidence in a medical provider and healthcare organization is important. Medical mistrust stems from historic events and institutional racism that perpetuate discrimination in society, causing the disbelief of individuals in a homogeneous healthcare system and its providers. This contributes to underutilization of healthcare and various health inequities. 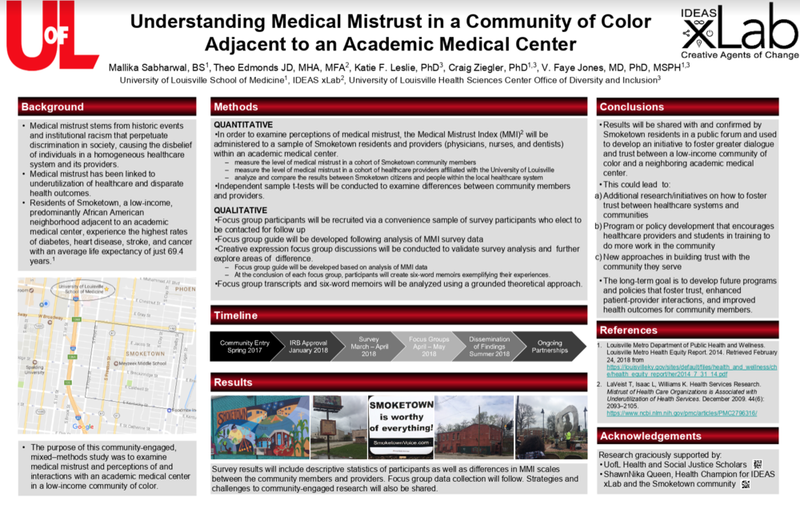 To address the gaps in access to care in the Smoketown community it is important to understand the perception of medical mistrust by administering the Medical Mistrust Index (MMI) to Smoketown residents and local healthcare providers. This will allow investigators to compare how people within the healthcare system perceive it and how clients of the healthcare system perceive it. Once results are analyzed a focus group will be facilitated where participants will create six-word memoirs exemplifying their experiences in healthcare. These memoirs will be shared with the Smoketown community and local healthcare providers. The goal of this project is to support the healthcare system in creating a new approach in building trust with the community they serve. IDEAS xLab intentionally crafts an approach that puts artists working together with healthcare professionals. Beginning Spring 2017, IDEAS xLab embarked on a new partnership that will activate new thinking around health equity and social justice by pairing artists together with medical students at the University of Louisville in The Health and Social Justice Scholars Program. This program provides a unique opportunity of educating professional and doctoral students in an inter-professional manner to produce high quality scholarly activities related to health equity, health and healthcare disparities, social justice, and healthcare innovation with the goal of benefitting underserved and disadvantaged populations. The program is comprehensive, providing scholars conceptual learning modules, research experience, mentoring, service learning, and professional development. The program is managed by the Health Sciences Center (HSC) Office of Diversity and Inclusion with high collaboration with Schools of Dentistry, Medicine, Nursing, and Public Health and Information Sciences, as well as community partners like IDEAS xLab. As an undergraduate student at the University of Florida, Mallika Sabharwal volunteered at the Equal Access Clinic, a student-run free clinic that provided medical care to underinsured communities in North Florida. Patients were often uninsured, homeless, or undocumented immigrants. Learning how the clinic addresses non-medical barriers she designed a social services resource manual for volunteers to refer to patients, like local GED classes and federal aid program enrollment. Before starting medical school, she worked at the Chicago Department of Public Health through the CDC’s Public Health Associate Program. In Chicago, Mallika worked in the school-based sexually transmitted disease program which educated and tested high school students on the south and west sides of the city, areas of high morbidity that also lacked health care professionals. Currently a second year medical student at the University of Louisville, Mallika is an active member of Students for a National Health Program, advocating for equitable and affordable healthcare for vulnerable populations.